Chris Canty’s first season as a Giant was not what you’d call a memorable one. He was sidelined most of the season with nagging hamstring injuries. Canty, was part of Big Blue’s signing spree. He was supposed to be the blue-chipper of the class, as he signed the largest contract, which was a six-year contract worth $42 million, with $17.25 million guaranteed. The Giants’ were hoping Canty would help the defensive line, and provide an anchor in the middle. Canty played in just 8 games, starting in four. Canty didn’t record a sack, he managed a meager 0.5 sacks. This season, the Giants’ and Canty are hoping he can provide leadership and anchor the line. 3-4 to 4-3 Issues: Chris Canty thrived in the three-four defense. Usually, in the three-four defense, he was lined up over the guard taking double teams, which would free up the two ends and linebackers to rush the Quarterback and make plays in the backfield. 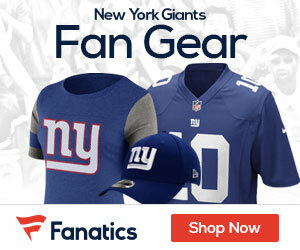 When Canty signed with the Giants’ there weren’t questions on if Canty could make the switch, as usually it is harder to make the switch from the four-three to the three-four (Albert Haynesworth, as an example). Canty got hurt in training camp which hurt the early phases of making the transition. A transition like that usually takes about a year, for linemen it tends to be less, but with early and nagging injuries, sometimes it takes a full year to make the adjustment. Fully healthy, Chris Canty figures to be in the Giants’ plans, as it seems he will be the starter alongside Barry Cofield. The Giants' are hoping Chris Canty can stay healthy and be an impact on the defensive line this season. A Moose: “I’m stronger than I’ve ever been,” the 6-7, 304-pound Canty said. Canty is 6 foot 7. According to Ralph Vacchiano, he’s batted down three balls at the line of scrimmage this training camp, and that’s something the Giants’ are looking forward to seeing him do in games this up-coming season. In one of his batted balls, he batted the ball right to LB Clint Sintim. That’s something I’d drool to see him do this season. What can you Expect from Chris Canty in 2010? You can expect big things from Chris Canty in 2010. When healthy he’s a force to be reckoned with. Canty will provide leadership alongside Justin Tuck on the Defensive Line and will help anchor it. He will also stuff the run and allow others to make plays. Canty could end up being the breakout player on the team. He’s got tons of ability, it’s time for Canty to pay dividends on the large contract he was signed too. What do you think about Chris Canty? I thought that was a good signing last year, the guy never missed a practice with Dallas in 4 years, so it was pretty annoying what happened to him last year. If he stays healthy, he’ll be a big piece of the DL.